Flowering bulbs have become some of the most popular and best loved flowers in the world. Tulips, crocuses, hyacinths, daffodils, and irises are universal symbols of spring. Their lush and colorful flowers are the first to bring life back to a barren winter landscape. Summer-flowering bulbs such as dahlias, begonias and anemones bring variety, texture, unique color and long flowering times to summer gardens. Planted with care and planning, bulbs can keep a garden alive with color from the last snows of winter through the first frosts of fall. Bulbs generally fall into two groups: spring-flowering and summer-flowering . A more accurate grouping, however, divides bulbs into hardy and tender varieties. As a rule, spring-flowering bulbs are hardy bulbs. These bulbs are planted in the fall, generally before the first frost. They require a sustained "dormant" period of cold temperatures to stimulate root development. Many hardy bulbs, such as daffodils, perennialize well and can be left in the ground to flower year after year. Most summer-flowering bulbs are tender bulbs. These bulbs cannot survive harsh winter conditions and must be planted in spring after the last frost of the season. To enjoy these bulbs year after year, they must be dug up in fall and stored indoors over the winter. A notable exception is the lily. 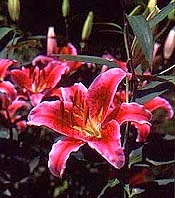 Many summer-flowering lily varieties are quite hardy and can be planted in either fall or spring. Technically speaking, many popular "bulb" flowers are not produced from true bulbs at all. Crocuses and gladioli, for example, are really corms, while such favorites as dahlias and begonias are really tubers. The differences between bulbs and corms are slight, and indeed the two look very similar. The main distinguishing trait is the method of storing food. A bulb is composed of fleshy scales, like an onion, which protect a bud at the base. A corm, however, has the bud at the top aand is a solid mass of starchy material that tends to be much flatter in shape (sort of like someone squashed it down). Tubers and roots are easily distinguished from bulbs and corms. They have no protective tunic and are really just enlarged stem tissue. They come in a variety of shapes, from cylindrical, to flat, to just about any combination you can imagine. Many come in clusters. In addition to tulips and daffodils, you'll also want to plant other exotic Dutch bulbs, such as spring-flowering scilla, puschkinia, muscari, fritillaria, allium, camassia, and eremurus. Your local climate will affect which bulbs you choose to plant. Not all bulbs have the same cold requirements. Spring-flowering bulbs offer a wide variety of colors, heights and flowering periods. Let your imagination run wild, easy-to-grow bulbs allow you to concentrate on garden design. By cutting out pictures from mail-order catalogues or booklets picked up at your local garden center, you can plan your dream garden on paper right in your own living room! In order to enjoy the glorious bulb flowers that bloom in spring -- such as tulips, daffodils, hyacinths, crocus and others -- you must plant them in the fall because they require a sustained "dormant" period of cold temperatures to stimulate root development. As a rule, the colder your climate, the earlier you plant. In colder northern climates, for example, plant in September or October. In warmer climates you may need to plant bulbs in December (or even later). The only universal rule is that, spring-flowering bulbs must be planted before the first hard frost. It's best to plant bulbs as soon as possible after bringing them home. If you must store them, keep them dry and cool -- between 50 and 60 degrees (F). For long storage periods, a refrigerator vegetable compartment can be used, but be sure to keep them away from ripening fruit. The gas emitted by fruit's ripening process can destroy bulbs. Remember, any condition causing the bulbs to shrivel will injure them. If storing in a cold cellar, please keep in mind that squirrels, rats and mice absolutely love to dine on bulbs. When planning a garden, consider your local climate and the established "hardiness rating" of various plants you have in mind. Some plants cannot handle severe winters; others wither in heat; still others, such as many spring-flowering bulbs, need a cold period to stimulate growth cycles. Look at plant labels, bulb packaging, catalogues and reference books for the hardiness ratings of individual plants. Plant spring-flowering bulbs in your area 6 weeks before the ground freezes. If the soil is very heavy, add compost or peat moss as well as coarse sand. <li>When cutting flowers, leave as much foliage as possible: the leaves are the food-manufacturing organs, and it is their function to prepare food enough to be transported to and stored in the bulbs to insure sturdy growth and flower production the following year. <li>Experiment. You know better than the experts what flowers you fancy. Pick a flower bulb variety on a whim and try a small planting. If it does well for you, add more next year. <li> Transfer to a warm room to flower.